Welcome to Motor Mate, specialist in car accessories. 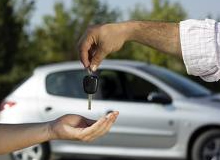 We are a long established independent company selling everything the motorist needs, from wiper blades to tow bars, car batteries to security alarms. Visit our showroom in Addlestone, to see our huge selection of motoring products and accessories. 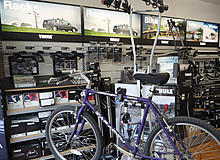 As Surrey’s biggest Thule dealer, we have an extensive range of Thule products on display, such as roof boxes, tow bars, roof racks and cycle racks, water sports and winter sports carriers. 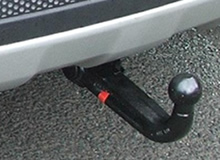 We also offer a free mobile fitting service for tow bars. On site we have a fully equipped workshop, and can provide general repairs and servicing for your vehicle, including MOTs and auto electrical work. 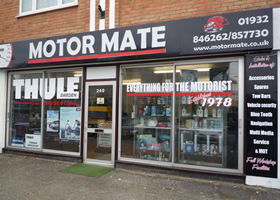 At Motor Mate we have a wealth of experience and expertise in motor accessories and auto repairs and are proud to provide a friendly, professional and reliable service at all times.